(Portland, OR) – With high-rise mass timber buildings springing up all over Portland, the United States, and the world, it only makes sense for the World Forestry Center to bring to light the amazing story of the mass timber phenomenon in its newest exhibit, The Future of Tall. On view through summer 2018, The Future of Tall tells of the strength, versatility, fabrication, and installation processes of mass timber products that are being used today to build multi-story buildings that are cost-competitive, carbon-efficient, sustainable, and reliable. On display in the museum’s first floor Special Exhibits Gallery, visitors will be introduced to mass timber through stunning visual display panels, videos, and hands-on pieces. The exhibit also features a spectacular 13-foot mass timber bench originally displayed in the Portland Art Museum’s John Yeon exhibit. The term “mass timber” refers to a style of solid wood framing that incorporates engineered wood products that are often panelized as both vertical and horizontal members. The term is derived from the fact that the products used in mass timber construction are often quite massive. Mass timber products, including cross-laminated timber (CLT), nail laminated timber (NLT), dowel-laminated timber (DLT), glue-laminated beams, columns and panels (glulam), and mass plywood panel (MPP), are manufactured by assembling smaller pieces of lumber or veneer into much larger pieces using nails, dowels, or adhesives. The engineered nature of these products provides them the strength, and earthquake and fire resistance needed to make them suitable for use in very large structures. 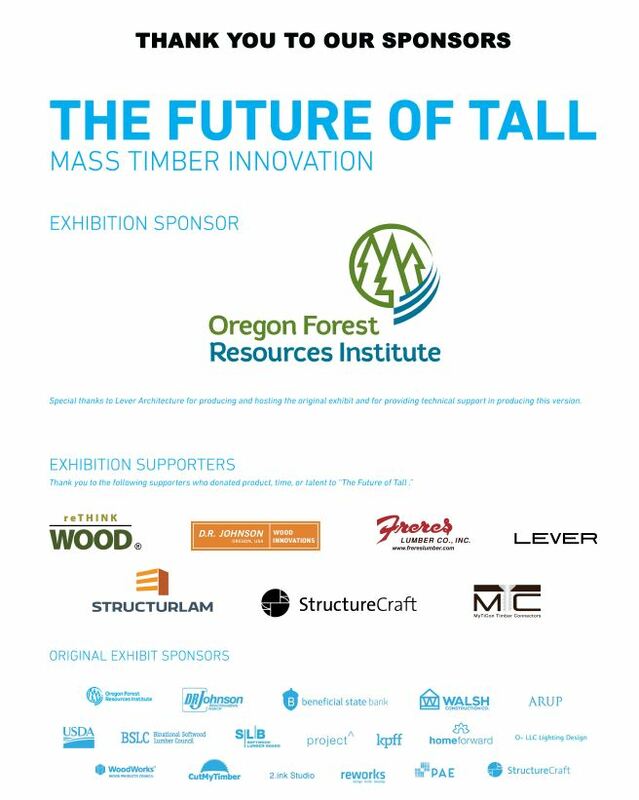 The Future of Tall is made possible by a grant from the Oregon Forest Resources Institute and support from LEVER Architecture. Located in Portland’s beautiful Washington Park, the 20,000 square foot Discovery Museum is sure to delight anyone from ages 3 to 103. Visitors will be both educated and entertained as they learn about the importance of forests and trees in our lives, as well as environmental sustainability. Built in dramatic Cascadian style architecture, the museum has been a Portland icon since 1971. Visitors can take a wet-free raft ride, see the forest from a bird’s-eye-view, learn about different people who work in the forest, and “travel” to Russia, China, South Africa and Brazil to discover how those regions are utilizing their forests and the challenges they face.